The first week in the office in St Leon Rot has been all about listening and learning. I’m spending my time getting to know people, product and processes. It is a surreal mix of familiar and new, of different and similar. Lunch is the same, but many things have changed. What has surprised me the most is the speed at which product decisions are made. I sat in on the call that reviewed what was built in the last release and I was flabbergasted as to how much happened in 90 days. I also listened in the on the first sprint call for the next release. Lots happening. Much less hierarchy, more autonomy. The let’s get done attitude is contagious, and it has seeped into the SAP colleagues I have met this week. I see a spring in the step inside SAP that was largely missing when I last worked here. The quarterly release business sharpens the mind. Less powerpoint, higher velocity. Some of this is due to the cloud delivery model, but there is a cultural element too. I like. I have much to learn. Today is my last day at Gartner. The last 5 1/2 years have flown by. I have learnt more than I imagined I could, and probably forgotten more too. I’ve done over 3000 inquiries, written over 100 research notes, led several magic quadrants, attended 100s of Research communities, spoke at numerous conferences and strategy days. I’ve worked with fascinating colleagues, users and vendors from around the world. I consider many of them to be friends, even though we have met so rarely in person. 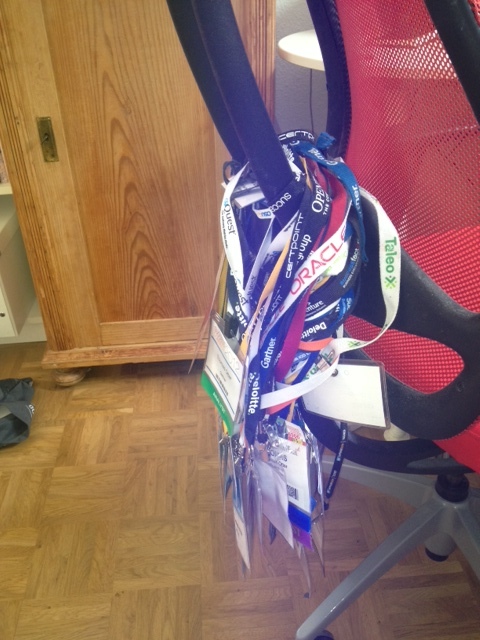 It has been a blast, and I will look upon my time at Gartner with a deep fondness. The way Gartner has handled my departure only increases my respect for the organization. I expect to see Gartner’s HCM research grow from strength to strength. So if it has been so good, why change? As an analyst, you advise, you can suggest and you may even influence markets. That influence gave me a tremendous sense of satisfaction and respect for the responsibility that the role brings. But for the past few months I’d begun to wonder whether I wanted to remain an analyst for the rest of my career or not. I wasn’t really sure, but I felt a nagging itch. It took a while, but I have figured out what that itch is. It is the itch to build something. This weekend I will be getting on a plane to Sapphire, the SAP annual conference, not as a Gartner analyst, but as a SuccessFactors employee. I’m going to be the product manager for Employee Central. You can see the welcoming press release here. I’m nervous, as I will need to learn a whole new raft of skills. I’m excited for the very same reasons. Some of you reading this will know that I worked for SAP before joining Gartner, so you may be wondering why join SuccessFactors, which is part of SAP? Here are my reasons. I reckon this is the most exciting job at the most exciting company in HCM technology today. More broadly, HCM technology is the most dynamic place in application software now. What happens in HCM today will shape enterprise applications for the next 20 years. The investment, focus and market landscape is fundamentally different from where it was 5 years ago. Successfactors very rapidly developed a market leadership position in Talent Management software, and they have the opportunity to do the same in cloud core HRMS. Combining SAP’s deep experience and massive presence in core HRMS and Successfactors will make for a powerful combination. I think I can help make them work better together. I understand some of SAP’s strengths and weaknesses, its culture and how to get things done. There is no better salesforce in enterprise software. When aligned, is remarkable. The leadership team at SuccessFactors and SAP have very clear idea of what they would like me to do. I have seen too many analysts be hired into strategy roles, and then whither on the vine of large vendor politics. It is crystal clear that my fundamental job is to lead the team building Employee Central. This will be a massive challenge. I look forward to the learning curve. In the 1995 Klaus Tschira, one of the SAP founders, impressed me so much with his vision for HR technology that I convinced my wife that we needed to move to Germany. There is much in that vision that still needs to be built, so in a sense I have unfinished business with SAP. My day today is tinged with feelings of farewell, but I can’t wait to start my new role . To my colleagues at Gartner, I’ll reiterate my thanks for 5 fabulous years. To my new colleagues at SuccessFactors and SAP, thanks for the lovely welcome. Author Thomas OtterPosted on May 10, 2013 Categories Gartner, HR Technology, SAPTags Gartner, SAP, SuccessFactors20 Comments on Today is my last day at Gartner.